Jack Pearce reflected on a spell of three winless games in eight days and told his players: This can’t go on. 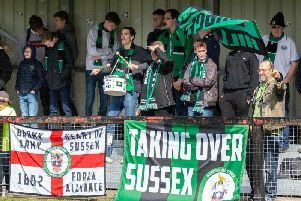 The Bognor manager felt they were the better team in games against Folkestone, Margate and Hythe – but said the fact they drew one and lost two showed failure to take chances was a significant problem. He has indicated he will extend the Rocks’ playing budget to bring in players to replace those not doing their jobs – while dealing with a growing injury crisis that looks like leaving him and coach Robbie Blake without five key players for the tricky-looking FA Trophy visit to Bracknell on Saturday. After last Tuesday’s defensive horror show that saw them lose 4-2 to Folkestone, Bognor were back at Nyewood Lane on Saturday for a 0-0 draw with Margate in which they dominated for long spells without taking chances. And there were opportunities galore in the Velocity Trophy second-round tie at Bostik south-east side Hythe Town, but after going ahead through Tommy Scutt early on, the hosts hit back to win 2-1. That was Bognor’s second cup defeat this season against a lower-ranked team and they face another such test at Bracknell – who are top of Bostik south central and in flying form – in the first qualifying round of the Trophy on Saturday. Pearce said most of Bognor’s problems were up front but he was also unhappy with some of their defending. He said: “When you go 1-0 up and create nine one-on-one chances, as we did at Hythe, you really should be winning. “There is a problem and we have to face it and deal with it. Without Dan Smith up front, there are shades of last season in that we are playing nice football, controlling possession and creatng chances but not sticking the ball in the net. “In the past three games we’ve been the better team in each one in my view – and we have not won any of them. And we’ve now played three games in the cups against sides from lower divisions and battered them – and not won one. “There’s no point having lots of possession if you can’t score goals. My job now is to get people in who can score. “We have players who are in the comfort zone and I need to be able to show them they will not play if they are not producing the goods. And I have no qualms about doing that. “Tommy Scutt has shown composure in front of goal in a couple of recent games, but as a team, our composure in that area is appalling. Pearce also has concerns at the other end of the pitch. “I’m not happy with some of our defending either, and it does not help that our injury problems are affecting centre-forwards and centre-halves. “We are stepping up our search for new players, although it will be difficult to do that ahead of the FA Trophy game. In that, you can’t use players who have already played for another club, while clubs won’t want to loan you someone who then gets Trophy-tied. “But before the next league game (at Leatherhead on November 3) we will have to do something. Already injured before the past week’s games were striker Dan Smith (hip) and central defenders Keaton Wood and Corey Heath (both ankle). All three could be out for a few more weeks, but Smith is expected back sooner than the defensive duo. Another centre-half, Joe Dandy, picked up a minor knee problem in the draw with Margate and has gone back to parent club Pompey to be assessed, while newly re-signed striker Jimmy Wild has gone down with tonsilitis. The Rocks also lost Brad Lethbridge to Pompey in midweek – he was required for the Blues’ FA Youth Cup tie against Bristol Rovers – but he should be in the Bognor side at Bracknell on Saturday.